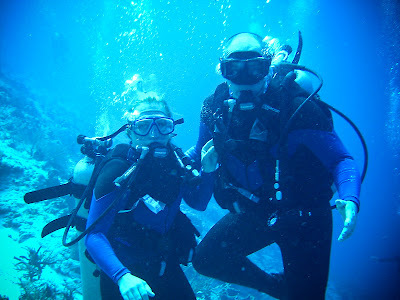 Ok, so I'll admit I was a little freaked out for this trip because the last time Dave and I went diving (two years ago) I was freezing to death and got into the water ready to go down before I realized I had no idea what I was doing. They were telling me to remember to equalize and check my pressure and all this stuff that sounded like a foreign language to me. 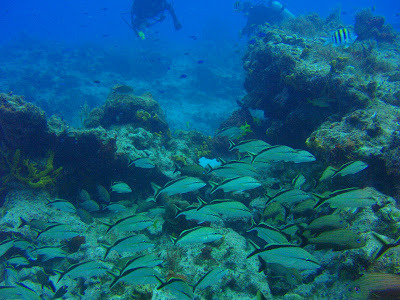 I couldn't remember a thing from our dives before that...ages ago. So I had decided diving wasn't my thing. Then Dave scheduled this trip as kind of a surprise to me and had it all arranged before I could really tell him I was too scared. And really, I was fooling myself if I thought I would ever turn down a trip of any sort to any location even if it involved slave labor and fingernails scraping on blackboards. I just love the adventure. So I was in. And as I mentioned before, Dave insisted on buying me a wet suit. Boy was I bugged at him for that. But man oh man I'm attached at the hip to that thing now and I'm going to wear it every chance I get from now on. (I'm going to make chances...anyone want to certify and come with us?) Anyway, I kept blessing Dave's name every time we hopped in the water and I didn't start shivering. 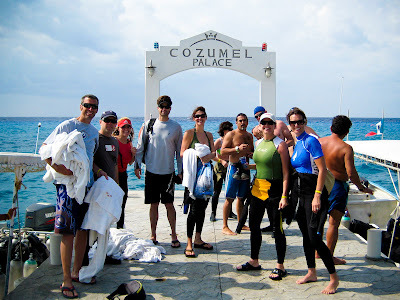 When the water wasn't too choppy (which wasn't often...it was so darn windy while we were there) our dive guys picked us up on their boats here at the hotel dock. 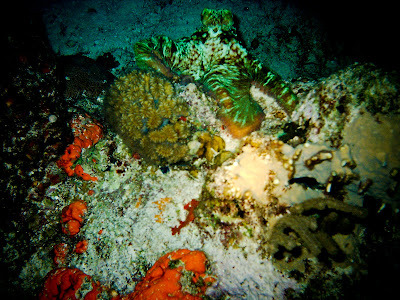 Here are some pictures of our night dive. 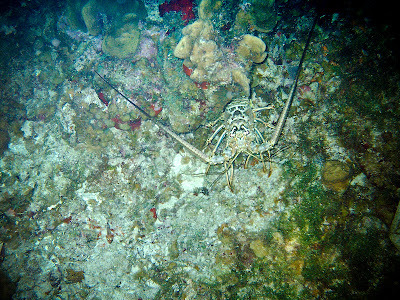 Yes, we even did a night dive. 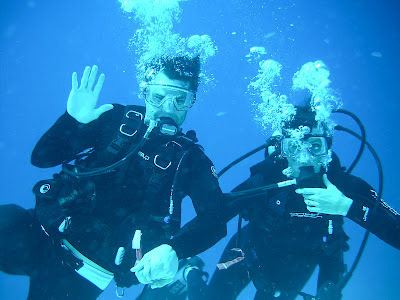 Although Tom and Melis liked the night dive better last year, I LOVED it. It was pretty cool to be down there in the pitch black with nothing but a flashlight. And even though I was scared to death to run into a shark before we left, by our night dive I was at the point that I wanted to bring it on. I would have loved to run into a shark (after being reassured that the chances of getting attacked were next to nothing). 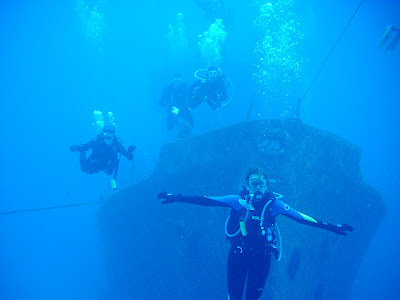 And here's our shipwreck dive. I wish I had more pictures of this one. It was awesome to "float" through this ship, especially when we saw this GIANT green eel at the bottom of one of the rooms. Those things are eerie! Ok so anyone interested and not certified, do it! I want to go swim with migrating whales next time...I heard that is the best. Get a wet suit! Where do you get certified? I'm totally ready to do it and have been thinking about it for a long, LONG time. 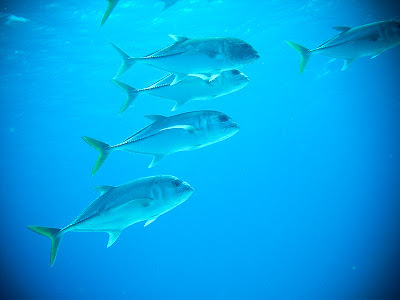 Thanks for posting the underwater pics. I haven't seen some of them and it was fun to show my kids. I am so glad you guys loved it as much as Tom and I.
I'm so happy to see these amazing pictures! Maybe I should get a wet suit for BCrank this winter. Anything to keep me warm up there in the Yukon sounds good to me! Mom, you can borrow my wet suit any time! Jen, it's pretty quick to get certified and I bet that's an awesome place to dive. Melis, I'm sending you a CD tomorrow. Karen, We will be here for Thanksgiving (with a bunch of my family too) but we'd love to catch up with you guys. Call us if you get a chance when you get here. Nice pics! I'm so sad we missed out. 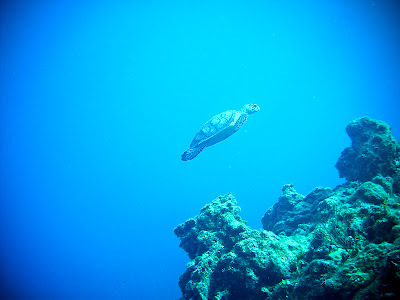 We are leaving on Friday to go to Maui and we have some diving scheduled then. 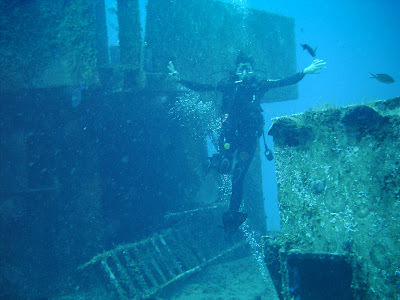 I think diving is one of the funnest things I've done. It is so peaceful. I'm glad you didn't run into a shark. 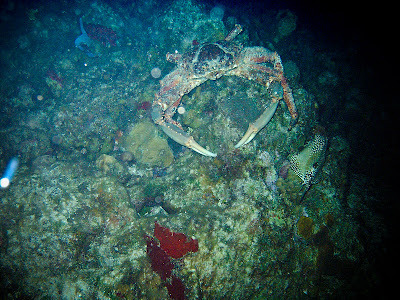 I'm not crazy about the night diving. I prefer the sunshine! Amazing underwater pictures. What a fun trip!!! I've never scuba dived because I get clausterphobic, but maybe I'll get brave enough to try it. And about your other post of feeling like underwater that is how I always feel when I come back from a trip. It always takes a while (at least a week)to get back into the swing of life. The laundry just piles, the schedules are hectic and the reponsibilities are endless. But you will get on top of it. YOu are an amazing mom!! !